Australia''s leading makeup artist, Rae Morris, provides fast, easy-to-achieve looks for women who want to look great in a hurry. 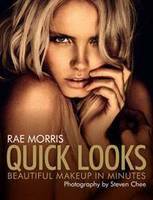 From the bestselling author of Makeup: The Ultimate Guide...Australia''s leading makeup artist, Rae Morris, is a veteran of major international runway shows, where speed is critical, so she knows how to achieve beautiful looks fast. In Quick Looks she reveals all the tricks and trade secrets she''s learnt over her highly successful career, from applying razor-sharp eyeliner to transforming your face with the perfect brow shape. And Rae''s number one tip? When you''re in a hurry, always do your eyes first, as you can easily apply foundation and lipstick in your compact or rear-view mirror...Full of sensational looks, with step-by-step photographs and easy-to-follow instructions on how to achieve them, Quick Looks is the must-have book for women who want to look gorgeous in just minutes.